Decades into our future, a stone's throw from the ancient city of Shanghai, a brilliant nanotechnologist named John Percival Hackworth has just broken the rigorous moral code of his tribe, the powerful neoVictorians. He's made an illicit copy of a state-of-the-art interactive device called A Young Ladys Illustrated Primer Commissioned by an eccentric duke for his grandchild, stolen for Hackworth's own daughter, the Primer's purpose is to educate and raise a girl capable of thinking for herself. It performs its function superbly. Unfortunately for Hackworth, his smuggled copy has fallen into the wrong hands. Young Nell and her brother Harv are thetes — members of the poor, tribeless class. Neglected by their mother, Harv looks after Nell. When he and his gang waylay a certain neo-Victorian — John Percival Hackworth — in the seamy streets of their neighborhood, Harv brings Nell something special: the Primer. Following the discovery of his crime, Hackworth begins an odyssey of his own. Expelled from the neo-Victorian paradise, squeezed by agents of Protocol Enforcement on one side and a Mandarin underworld crime lord on the other, he searches for an elusive figure known as the Alchemist. His quest and Nell's will ultimately lead them to another seeker whose fate is bound up with the Primer — a woman who holds the key to a vast, subversive information network that is destined to decode and reprogram the future of humanity. 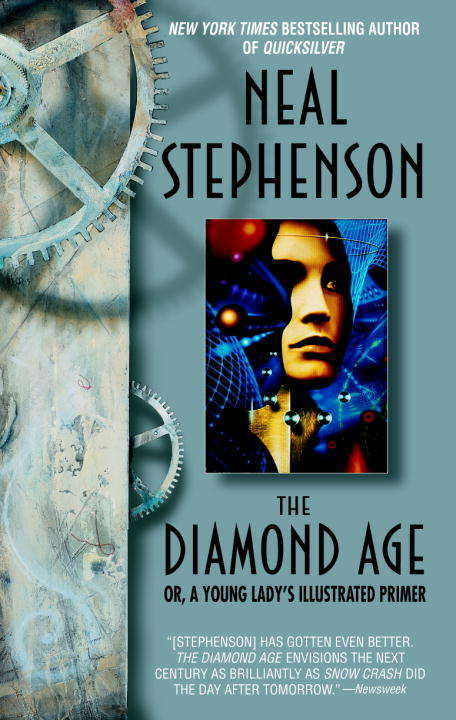 Vividly imagined, stunningly prophetic, and epic in scope, The Diamond Age is a major novel from one of the most visionary writers of our time.